Burgers. Our office’s favourite lunchtime meal. 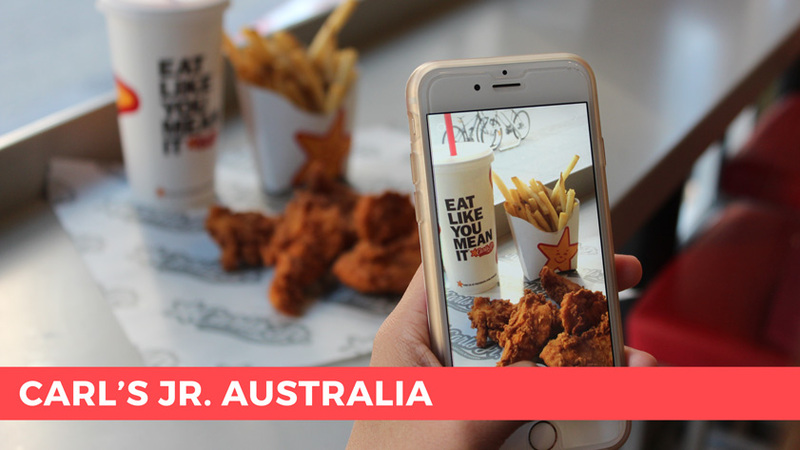 So when experiential agency George P. Johnson approached us launch and manage the social media accounts for Carl’s Jr. Australia, we jumped at the opportunity with napkins in our laps and refillable cups in our hands. The three-year project included launching and maintaining the official Carl’s Jr. Australia social media channels as well as store pages for the first 3 locations and executing live social activations at each store opening. The Carl’s Jr. Australia social channels were also the frontline of customer customer support, particular via Facebook Messenger. Our team were on-site (yes, several burgers were consumed) for the store openings at Bateau Bay (NSW), Brisbane Airport (QLD) and Redbank Plains (QLD), capturing content and managing communities on Facebook, Twitter and Instagram. There were also social-first activations in action, which rewarded customers for sharing photos of their Carl’s Jr. experience on social channels. Day-to-day, we managed the Carl’s Jr. Australia social channels, creating and publishing engaging content daily across all platforms. A mix of curating user-generated content and custom content including images, GIFs, animations, memes and video increased organic engagement and channel growth consistently since the launch. We placed a strong focus on community management with daily monitoring of all social channels, including outside of business hours and on weekends. A paid promotion strategy was implemented for Facebook and Instagram to build the audiences on these platforms, and create buzz around store openings and other activity. Attention Queensland, meet Redbank Plains’s first customer, @andrewhohipa. ❤️? In-depth monthly reporting providing ongoing analysis and data insights of content and paid advertising. Our entire approach to managing social media channels for this client combined the Carl’s Jr. global branding with content that would resonate with an Australian audience. Some of the biggest achievements were hitting huge growth and engagement milestones across social channels and having content shared on other Carl’s Jr. channels internationally.